The Sly Fox 360 IPA capitalizes on a great alien can design. Note the 360 End technology — the top of the can is completely open. Last week, Washington, D.C., was full of exciting new products, services, suppliers and speakers, educating and promoting the craft brewing industry at The Craft Brewers Conference and BrewExpo America (CBC), which spanned multiple floors at the Walter E. Washington Convention Center. The conference also sparked public events across Washington, D.C., as craft breweries from all over North America invaded bars, concert halls and restaurants, seizing the opportunity to showcase their newest craft beer creations (some made specifically for the show). Craft Brewing Business (CBB) roamed those halls, bars, seminars and trade show floors, meeting with loads of industry professionals that ranged from brewers to brewhouse manufacturers and seeing some amazing new products made specifically for the craft brewing industry. At one of my last booth visits on Thursday, I saw one of the coolest new product offering at the event. I was visiting Crown, an innovative metal packaging solutions provider. The company produces a wide range of metal packing services for customers in markets as diverse as the food and beauty industries, engineering everything from candy tins to beer cans. At the CBC, Crown was promoting another such game-changer. It’s called the 360 End, and this innovative beverage technology allows the entire lid of an aluminum can to be removed, turning it into a drinking vessel, eliminating the need for separate glassware and creating a whole new beer drinking experience. Crown was at the convention serving up craft beer from Sly Fox Brewing Co.; the Pennsylvania brewery had made a beer specifically for the convention, called 360 IPA, and it capitalized on the 360 End technology. With the April launch of Sly Fox’s Helles Golden Lager, its ninth canned beer, the Pottstown brewery will become the first brewery in North America to offer the 360 End to the public. What’s the idea again exactly? You grab a 360 End can, and on top you’ll see an extra big aluminum tab. Situate the can correctly in your hand, pull that tab back toward you, twist the can into place and pull off the entire top of the can. The cold, open can experience promotes environmental benefits, stadium friendliness and a new aromatic sophistication. Brian Thiel, regional sales manager with Crown Beverage Packaging USA, holds a can of Sly Fox’s 360 IPA with 360 End can technology. This particular can technology is not new. It was actually first manufactured in 2010 for SABMiller and the FIFA World Cup in South Africa. The premise of 360 End design has always been focused on stadium use. While Sly Fox’s Helles is the only brand scheduled to utilize Crown’s 360 End in North America today, the brewery’s flagship Pikeland Pils will be offered in the same format exclusively at Citizens Bank Park, the home of the Philadelphia Phillies, this spring and summer. “This technology allows the full flavor and aroma of the beer to hit the drinker’s senses and makes the can an even more appealing package for outdoor activities and situations where you want to be able to move around and sip your beer easily,” said Sly Fox head brewer Brian O’Reilly in a press release last week. Crown aims to work with other craft brewers who are interested in utilizing 360 End technology. 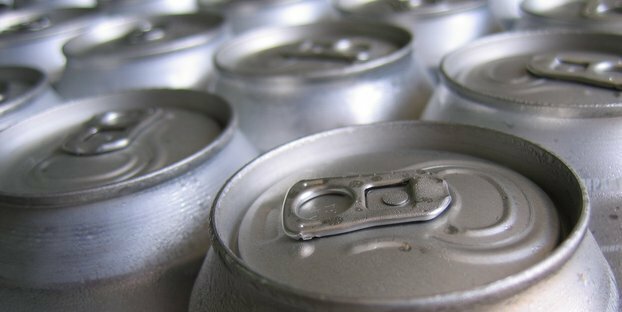 In addition to crowns, cans, Crown offers does metal packaging of all sorts across five business units: Aerosols, Beverage, Closures, Food, and Speciality Packaging. Besides the 360 End, Crown has primarily focused on designing and selling 12- and 16-oz cans to the craft industry. Mobile canning seems to be another trend the company is embracing. “Do your homework and realize that there are options out there,” said Thiel, “not only for choosing a can supplier, but choosing canning equipment. With the addition of mobile canning — just like mobile bottling has been there for wineries and craft brewers — now there are some tremendous, viable options in the mobile canning industry as well. And we at Crown are working with several, active mobile canners throughout the United States, providing services with our cans to craft customers. We like to form those types of relationships as well. From our perspective, Crown’s 360 End might be one of those next big things.